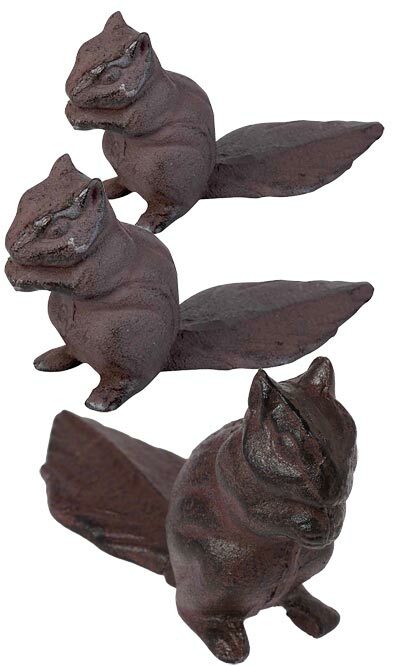 Highlight your love of wildlife throughout your house using these Esschert Design Cast Iron Squirrel Door Wedges. This charming figure adds a woodland motif to your home in moments, while the set of 3 is fantastic for use in several different rooms. Each squirrel figure rests on two legs, with two paws beneath the mouth grasping a treat. The tail of each unit extends outward, and the flat shape easily slides under a door. Crafted from cast iron, these hardy pieces make wonderful doorstops, heavy enough to hold a significant door open easily. Their dark brown hue with black accents furthers the natural look, and defined ridges on each face and tail lend extra dimension and style to the items. Enjoy squirrels keeping your doors open with these Cast Iron Squirrel Door Wedges. Note: This case pack contains 3 of the Esschert Design Cast Iron Squirrel Door Wedges.